Little Green’s Conditioning Hair Detangler is a leave-in product for kids that need a bit of extra help with their hair tangles. One of the hardest things to do with a kid is to get tangles and knots out of long hair. Firstly, it hurts when you pull it even the slightest bit. Secondly, try getting a child to sit still while you tug at his or her hair. Good luck with that. Little Green recognized this problem and developed their Conditioning Hair Detangler. I tried it out myself and it works wonders. I have a headful of tight curls and spritzed this on liberally after coming out of the shower. I worked it in a bit and then proceeded to easily brush my curls out. An added bonus was that it kept my hair in place, all day. It kept the flyaways at bay and kept my hair out of my face. 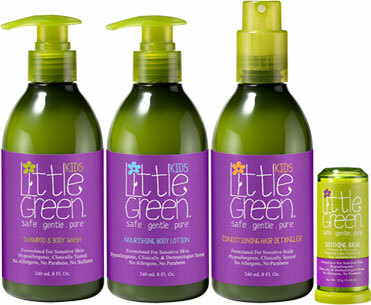 To read more about Little Green’s Conditioning Hair Detangler, click here.